Semi Rigid Epoxy Crack Repair | Expansion Joints | Control Joints | Superior Industries, Inc.
Fil-Eze is a 100% solids, 'two part' epoxy. It is tough and durable for repairing cracks, control joints, expansion joints and filling holes in high traffic areas. Fil-Eze is dispensed using the A-300 Applicator. A static mixer is included with each cartridge unit. Fil Eze #424, epoxy crack filler, is the product of choice for repairing hairline to mid sized cracks in concrete floors. Fil Eze is a semi rigid, 100% solids crack epoxy and does not shrink when used in these type applications. In addition, in concrete crack repair this material does not become brittle and allows for expansion and contraction. 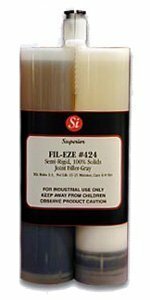 Fil Eze #424 is highly recommended for repairing control joints and expansion joints where slab movement occurs. Fil Eze #424 epoxy crack filler can be used with excellent results for the repair of hairline cracks in warehouse floors and production areas. This material can also be used for the repair of hairline cracks, control joints and expansion joints in areas where the ambient temperature reaches lows of 35°F (2°C). When used in lower temperatures, the cure time is extended to approximately eight hours. When using epoxy crack filler for the repair of hairline cracks, the dual component cartridge system is recommended and faster curing times can be achieved. The dual component cartridges are dispensed using the A-300 applicator. Each dual component cartridge is filled with 800 millileters of usable product. 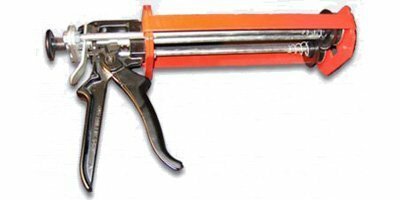 This applicator uses a static mixer and insures error free crack epoxy mixing especially on remote jobsites. Fil Eze #424 is color coded and appears as a light grey color when mixed properly. Hairline cracks are easily repaired and the use of a window squeegee is very helpful also. 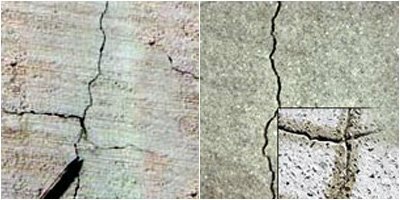 When using the A-300 applicator, hairline concrete crack repair is fast and easy. Simply dispense material into cracks, then pull excess material in one direction with squeegee. This insures that cracks and joints are filled to the proper level. No overfilling is required as Fil Eze #424 does not shrink when cured. For larger applications, Fil Eze #424 is packaged in 2 and 10 gallon kits. The material is mixed with equal parts of resin and catalyst. Fil Eze #424 crack epoxy is also excellent for repairing and filling void areas where block walls adjoin concrete slab. When filling deep cracks, a backer rod or compacted sand can be used. This prevents excessive consumption of product. All cracks and voids should be swept free of dust and debris prior to using the concrete crack repair filling. In some instances, a diamond blade crack chaser is recommended prior to filling with Fil Eze #424. This procedure removes loose cement and concrete, thus providing an acceptable surface for long term adhesion of product.